We wish to appoint for January 2009, an enthusiastic teacher to join our thriving, forward looking school, to teach maths to groups of children in KS1 and KS2. This is a part time post, based on 5 mornings teaching a week. At present there is no whole class responsibility. A School that provides a wide range of sporting opportunities and the chance to participate in high quality physical education and extra curricular Sport. The School must demonstrate continued commitment to school-club links and evident success. Mr Brook's daughter Helen (fo rmer pupil of Sir Robert Hitcham's) also received an award for the coaching that she does with young hockey players in Suffolk. Congratulations must go to ALL the teachers, parents, volunteers & pupils for all the efforts made to make sport in our school the success it is. Also thanks to Mrs Debenham for kindly nominating our school. We attended a very grand Sports Awards Ceremony on Sunday along with 3 Suffolk Olympian Competitors and many sports teams and organisations from around Suffolk. We were delighted to be awarded a perpetual trophy, an engraved trophy to keep, £100 and a framed certificate. We were very impressed to see our photo already in the EADT Monday morning Sports Insert. I am delighted to inform parents that Mrs Spencer is expecting a baby. I am very sad to say that Mrs Greenacre will be leaving us at the end of this term due to family commitments. I would like to thank her for all the hard work and dedication she has put in in her role as part time Maths teacher, we will miss her and wish her well. We are advertising this post, but if you know of anyone who may be interested in this role for 5 mornings each week, application forms can be obtained from the school office. If you would like to contribute to a leaving gift this can be given in at the office. CROSSING COLLEGE ROADPlease can we ask that parents keep their children WITH them while crossing College Road. On occasions small children have arrived to cross the road unaccompanied because they have run ahead of their parents. Mrs Bone is only responsible for crossing them over the road; she really cannot be caring for them while the parents catch up. Thank you. Thank you to those of you who have returned the sponsorship envelopes, for those of you who still have them, please can we remind you to return them if you wish to do so. CHILDREN’S CHRISTMAS CARDSAgain please can we remind parents to either return the unwanted cards or the money (£5 per pack of 8) to the school office before the end of half term. Thank you. On Tuesday 18 November photos of all individual children and family groups will be taken. This year we are trying more informal shots of the individual children, you will receive a proof sheet with a choice of 3 poses for purchase. The children will be photographed in their white school shirts. If you wish to bring pre-school children into school to join your family group photo (which will be more formal as in previous years), please come to the hall at 8.30am. The Friends recently distributed leaflets about this website which, once you have registered, you can use to do internet shopping at many online stores. The online stores then give a % of your purchase price directly to our school (as your selected charity) – it does not cost you anything and the school benefits directly. The Friends politely ask that you consider using this when doing any online shopping. www.TheGivingMachine.co.uk. Thank you. HAVE YOU LOOKED AT THE SCHOOL BLOG RECENTLY? 21 family teams took part in our Friends Association Quiz. The hit-tech quiz (put together by Mr Brook and his daughter Amy) involved Interactive Voting - like in 'Who Wants to be a Millionaire'. Some of the rounds had video clips and photographs. It was an enjoyable evening which raised lots of money for the friends association. The Quiz was won by the Orrell Family - well done! A huge amount of hard work was put in to organising the event by members of the friends such as Mrs Debenham, Miller, Gooch, Harold, Beal, Smith and Whiteley. They all do a huge amount for the school - Thank you very much! 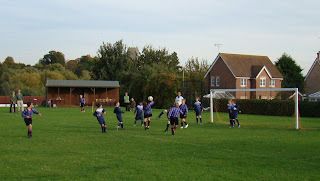 The Annual District Football tournament was held last Friday at Fressingfield. 12 teams took part from 10 schools (Framlingham and Debenham ham A & B teams). The teams were divided into 2 groups of 6 - all had to play each other. Our B team drew 3 matches. With more composure in front of goal thay could have won those games. They then lost 1-0 to Debenham's A Team - a great performance. They also lost 3-2 to Mellis - another good effort. Our A team (defending champions from last year) easily won their group with 4 wins from their 5 games. This meant that they progressed to the semi finals. Fram were drawn against Mellis. This proved to be the most exciting game of the tournament. Fram came from 1-0 down and 2-1 down to force extra time. Neither team could score in extra time but the rules said that a tie would be decided by the number of corners. Fram dominated extra time with 5 corners to 0 so were awarded a place in the final against Debenham. Our team was very tired (having had a very log semi final) and did not play with their usual energy in the final. Debenham took the lead just before half time. Fram equalised early in the second half but Debenham got a desrved winning goal to win the game 2-1. This was a fine performance by a young Fram team (half the team are in year 5) to finish as runners up. Do you want to practice learning how to use a protractor? Follow the link to this brilliant website. On Sunday afternoon, over 80 of our KS2 children gathered in Debenham with another 250 children from local schools, to record the songs for the One Christmas project. It was a great afternoon of singing, recording and filming for the CD that will be available to buy at the end of November. Some children experienced filming in front of a green screen while others just enjoyed the singing and some filming outside. We managed to record 14 out of the 15 songs in just less than 4 hours, many being recorded in just one take. The children sang beautifully and we are now looking forward to the concert in Felixstowe on the 7th December. Class DB hosted the first of our SHARE sessions. As part of Suffolk County Council Extended Schools Programme we have started to invite parents to spend time in school with their children. Two of our teaching assistants have been on a County course which looks at organising SHARE activities. Click on the logo to find out more. This first session involved a year 6 class inviting their parents to join them for their Science & ICT afternoon. The children have been looking at Forces this half term. During the SHARE afternoon the focus was on magnetism. A wide range of investigations were set up with the objectives of understanding that magnetism is a force and practical uses of magnetism. We had 16 parents for our SHARE afternoon and felt that everybody learnt something about school and magnetism! Hopefully other classes will be able to enjoy similar SHARE sessions throughout the year. Robert Hitcham's played their second league game of the season at home against local rivals Wickham. Hitcham's played teir best football of the season so far and quickly raced into a 3-0 half time lead thanks to more goals from captain William. In the second half 5 more goals came from Charlie (twice) and Milo (twice) with William completing his hat trick. Special credit goes to man of the match George Johnson who was making his debut for the school team. Final score Framlingham 8 Wickham 0.